Labor costs hit a new high as a percentage of sales last quarter. It isn't just rising chicken wing costs that are crimping Buffalo Wild Wings' (NASDAQ:BWLD) profits. The sports bar chain recently posted its highest labor spending in years: Employee costs jumped by 25% last quarter, outpacing the 20% sales gain. Labor costs are sitting at a new high for B-Dubs. The figure had held steady at 30% of sales through most of the last five years. But it jumped by a full percentage point to start off 2015. The extra spending has a real impact on profitability. Even though revenue improved by 20% last quarter, B-Dubs' earnings rose by just 2%. 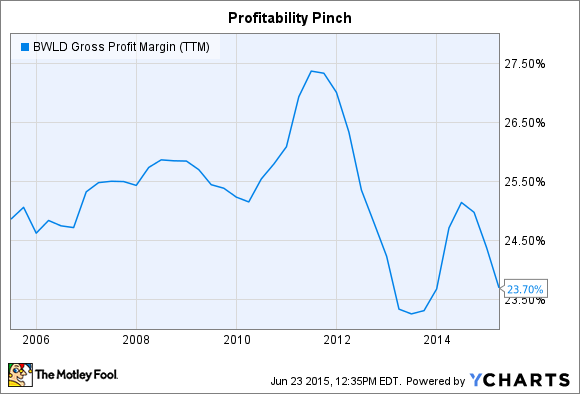 The restaurant chain's profit margin is now down almost 4 percentage points from the high it set in 2011. The extra labor cost is due to a new staffing position, called "guest experience captain," that B-Dubs has added to each of its 500 company-owned locations. According to job postings, this employee's job is to ensure an "authentic and unique experience for each guest that will build loyalty and help continue to deliver the ultimate social experience for sport fans." The dining experience is a core part of what distinguishes Buffalo Wild Wings' from its restaurant and sports bar competitors. In fact, management describes its overall goal as achieving "the ultimate guest experience" with its B-Dubs locations. That's why a typical restaurant has 60 high-def TVs, several massive projection screens, trivia games, and customizable programming. "We believe the design of our restaurants enhances our guests' experiences, drives repeat visits and solidifies the broad appeal of our concept," the company explained in its latest 10-K. Guest experience captains fit into the goal by helping guests take advantage of all these entertainment perks so they can get the most out of their trip to B-Dubs. And they're already making a positive contribution to the operation. B-Dubs' management credited these new employees with helping boost customer satisfaction and loyalty toward new highs since they started the position less than a year ago. And higher guest satisfaction is showing up in the restaurants' growth. Comparable-store sales increased by 7% at company-owned locations last quarter, one percentage point higher than at franchisees. That marked the seventh straight quarter that B-Dubs' corporate sales growth beat its franchisees. A key reason for that outperformance, management believes, is the fact that guest experience captains have made their way into all company locations but haven't yet been adopted by most franchisees. It shouldn't be long before they jump on board, though. And as for the company's costs, its labor bill is expected to climb again next quarter to as high as 32% of sales. Investors can then expect costs to come back down as the company crosses a full year of having guest experience captains in place. Without another big investment in that area the higher customer traffic should drive labor costs back down toward the long-term average of 30% of sales.